Homemade popiah skin is very rare these days so I was surprised to discover this stall recently. It was only after the visit did I learn that Fu Cheng is managed by a family of four who started their first stall in Blk 69, Geylang Bahru Hawker Center. Thanks to the engineer-trained father who developed his Popiah machine to expand the production, they are now supplying to not only their 10 island wide outlets but also catering to many hotels and restaurants. You might know them better as Fortune Food, a fully-established company which produces freshly-made halal popiah 365 days a year. They even have DIY popiah sets, kueh pie tee or even laksa party sets available for order online or via phone. Never knew popiah business can be managed at such a grand scale! In an interview with ST Sunday Times, Professor Tommy Koh, the Ambassador-at-large for the Ministry of Foreign Affairs, who lived in New York for 13 years as Singapore's permanent representative to the United Nations and 6 years in Washington D.C. as Singapore's ambassador to the United States, counts THIS as one of his favourite food from Empress Hawker. I believed Professor Koh must be highly knowledgeable on the best hawker food in Singapore, given that he has also been a judge for Singapore Hawker Masters for the past five years. Hence, I noted this down and wanted to try it during the visit when I had POH's chye poh hor fun. Unfortunately, the stall was closed then. Nonetheless, I return to try my luck during a Saturday lunchtime and it was opened! The rojak comes in a standard size of $3 but the owner will kindly accommodate your request if you want more than $3. Are you bored of the conventional brands off ice cream in supermarkets or looking for higher quality and healthier gelato for your family? Try Papitto, a Singapore online gelato retailer . pints that has been churning the low-fat Italian frozen treat since June 2005. When I first tried Papitto a couple of months back, the Strawberry Cheesecake flavour set my heart aflutter as it was lighter in texture than the real cheesecake yet no less authentic due to the chunky graham crumbs and fresh strawberries folded into the cream. 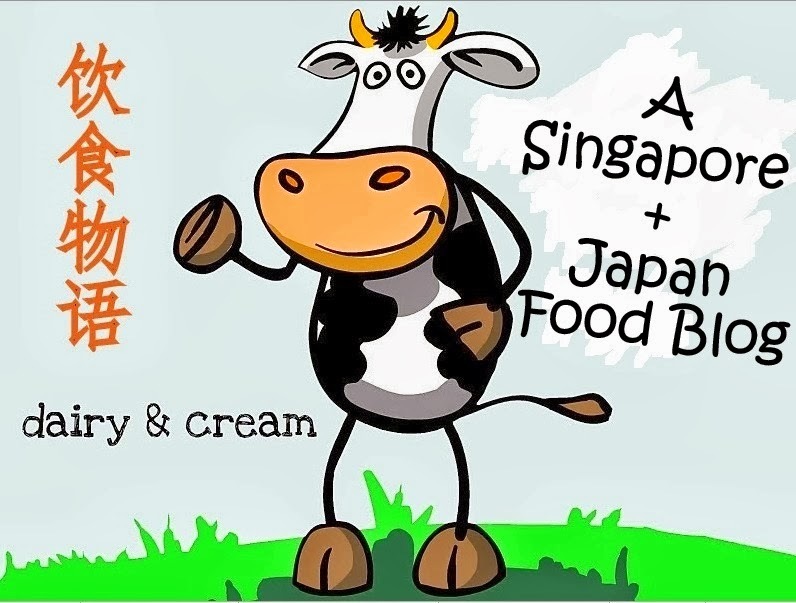 PeraMakan @ TANGS Orchard : Teh Halia or Kopi Susu Choux Puffs? Rojak, Ban Chang Kueh, Char Kway Teow, Chendol....I didn't expect the number of food stalls at TANGS basement to increase to the scale of a food court all of a sudden. The Nyonya Mee Siam ($6) is both tart and tangy, served with the powerful chincalok sauce for the extra kick. This dry version may be quite scarce on the ingredients like shrimps, etc. but it tastes even more flavorful than the usual wet Mee Siam. Even Pretty Mum who is super picky about her mee siam gave her thumb of approval. Looking at the display of assorted chap chye and rendang, we could not resist the temptation but ordered some to go along with the Mee Siam (3 assorted dishes with rice at $7.80). Unfortunately, out of the 3 choices, I only enjoyed the Nyonya Chap Chye. The Pineapples Assam Fish was not fresh and it was difficult to ignore the powdery texture of the fish. Meanwhile, the Curry Vegetables could do with less coconut milk. Interestingly, Peramakan has introduced a new series of French pastries with an Asian twist, on top of their already wide variety of kuehs and cakes. I instantly picked the two massive Cream Puffs in Teh Halia and Kopi Susu ($4.50), which sounded intriguing and unique. Though they were generously filled with cream, I was not sure if that was a good thing as the cream was too thick and could be less viscous. There were just good hints of ginger in Teh Halia, which means "ginger tea", with bits of grated ginger that lent an interesting note to the puff. However, the Kopi Susur stood out with its aromatic coffee notes and somehow, managed to sustain our interests to the end. For once, I thought the cream was quite an overkill. Although I could not detect much Gula Melaka in the Sticky Date Pudding ($5.00, pic below) , the moist chewy texture took to my fancy, especially with the salty buttercream to offset the sweetness. Nonetheless, I think I still enjoy their old school kuehs best. For instance, the soft rice layer in the Kueh Salaat ($2.20/portion of 2 slices) has just that perfect dose of salt, complementing the sweet yet silky Pandan custard. Just as most people will bee-line for Chao Zhou Fishball Noodle, I thought Lau Pa Sat Fishball Minced Meat Noodles is also another unexpected good find in the hawker center. There were only two options; either Fishball minced meat or Mushroom minced meat at $3/$4. It was a quick decision for me to pick the Fishball minced meat noodles since the stall was named after it. The Mee Pok here is thinner than the average Mee Pok and could easily be mistaken as yellow noodles.Yet they were fresh and toothsome, perhaps even outshining the classic meepok. There was no trace of vinegar but the punchy chilli and soy sauce contributed to a tremendous bowl that caught me swooshing up the noodles in delight. A wild fistful of cilantro, pork liver, minced meats and crispy pork bits made for a nice recalibration of the palate. 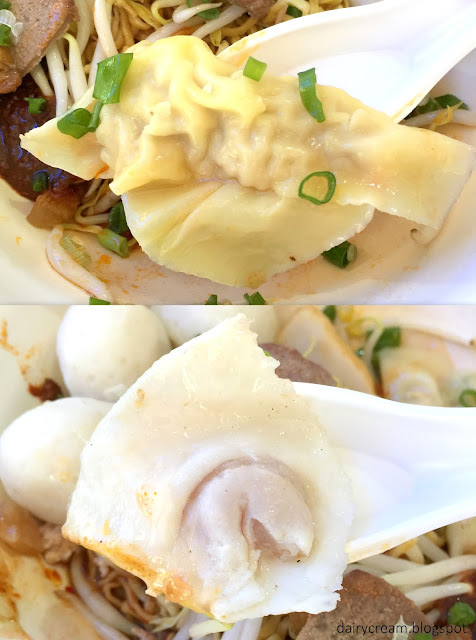 But what I liked most is the generous addition juicy shrimp dumplings and He Kiao, which is less visible in bak chor Mee these days. The only problem seemed to lie in the fishballs that were not very springy. But nonetheless, it's a very huge and satisfying bowl that sustained my enthusiasm right to the end. Bread is the first thing I think of when it comes to Paris Baguette Cafe so I was quite surprised to learn that it has launched 4 new bing su. Or maybe it isn't such a surprise since Paris Baguette is still a Korean franchise. The Matcha Bingsu ($12), which is a sizeable good-for-sharing portion loaded generously with sweet red beans, turned out to be an enjoyable one. The flakes might not be as fine as Oma Spoon but this is less sweet and there is enough red beans to last till the very end. On the other hand, the cakes did not fare as well as the Bingsu. The Foret Noire lacked the necessary moisture and intensity of cacao notes, making it quite an unpalatable and expensive cake at $7.50. This small 12-seater Japanese sushi restaurant is not located in Shibuya but right in Singapore. Thanks to myfoodsirens recommendation, I've got in touch with some exquisite sushi since my last raw fish experience was back in Japan last year. The menu is small but clearly focused on sushi and sashimi, so do not expect any chawanmushi, tonkatsu or any izakaya grub bites. I am not familiar with the average pricing but dining here do not come cheap. Without the 50% groupon deal, I doubt I can even step foot into this restaurant in the first place. The starters such as yuzu goma salad ($12) or the tai carpaccio with fresh uni and truffle shoyu ($32) were decent but not as outstanding as their sushi, which is the forte of the restaurant. Slathered with some mayonnaise before being torched lightly, the Aburi Sake Belly Sushi (2 pcs for $14) offers the right amount of creaminess without being overwhelmingly rich. However, it vanished in one or two mouthfuls, leaving me yearning for more. For something more substantial, there are 4 types of rice bowls ranging from $35~$45. There is the standard chirashi bowl ($35) but we opted for the more deluxe version with the truffles at $45. Each bowl of rice is sprinkled with furikake before the assorted fresh sashimi is arranged on it. It was not only the few precious truffle shavings which enhanced the sweetness of the fish, but also the truffle shoyu that had been mixed into the rice which completed this delicious bowl. For those who prefer Omakase, there is three options starting from $99/pax for 5-6 courses. Currently, this place is still in its soft opening and will soon be officially launch from end Sept. Being a cost-minded person, I would have to think thrice or more before making any return visit. Some people squeal in delight when they see these. Some people say they can't bear to eat them. Animal doughnuts are indeed cho-Kawaii (super cute) but I'm sorry to say that I am not a fan of the taste. Yes, these baked doughnuts do appeal to the health-conscious consumers since they are not deep fried and do not contain any artificial preservatives. However, each one was rather greasy with a strange stench of stale oil. Their cakey texture is reminiscent of a financier, yet not as moist and fragrant. The only saving grace was the moderate use of sugar, to the extent that some might find it plain. That said, most of the Floresta outlets in Tokyo are located in the suburbs hence accessibility can quite inconvenient unless you managed to bump into their temporary pop-up stalls in major department stores. Animal doughnuts are only part of Floresta's product line which include regular baked doughnuts, seasonal flavors such as Limoncello Earl Grey, ice cream, organic pound cakes. Some outlets also provide cafe desserts such as affogato, parfaits and puddings. For me, I'll save my calories and money for either cakes or real doughnuts but not something in-between. The taste simply failed to impress. When Shibuya Hikarie, the youngest landmark of Shibuya opened back in, one of the shops that caught my attention was this takeaway bakery shop called La Boulangerie Quignon. Meaning "crust" in French, Quignon stood out from the typical bakeries because it specializes in English scones that are made with full fat cream. Regular flavors include the marble chocolate, cacao orange, red tea and the best-selling maple. I've tried a couple and they were not outstanding but decent. The matcha and black sesame scone were on the dry side but they were not as sweet as the ones from Gontran Cherrier or D&D Tokyo. Meanwhile, the use of purely cream instead of butter did impart a distinctive milk aroma to these leaf-shaped bakes. This boulangerie offer breads that totally different from the artisanal French croissants or brioche which one can easily find at La Joel Robuchon Bakery which is just parked next to it. They focus on classic Japanese bread such as Melon Pan, Anpan and Katsu Sandwich. In fact, if you head to their main outlet in Tachikawa or Kokubunji area, there is a wider variety to pick from. But I guessed the breads here sit on the borderline average and are not worth the extra trip into the suburbs. I wondered if the old auntie who took my orders was having a bad morning as she was pulling a glum face. Fortunately, it was another auntie who was rolling the popiah, though each roll turned out smaller than expected. Nitty gritty issues aside, I must confessed that the rolls here are one of the better ones I've had. I doubt it was because I ordered "加辣" as the rolls weren't very spicy. Yet the medley of juices from the braised turnips, sweet sauce and chilli made them extra flavorful. Although bits of soggy skin stuck to the plate, they were supple enough to hold the fillings, yet yielding moist and chewy bites. Gritty, juicy with tingling heat beneath the sweetness, each mouthful was a sensation. Much has been written or reported about this dessert stall which is famous for their homemade Chendol ($1.50/$2.20 for durian top-up) Memorable chendols so far include the ones from Papparich and Jin Jin Dessert but I would gladly add this to my list. It might not look impressive with all the colorful ingredients buried below but once you start stirring everything, it becomes a tasty bowl of brown slushie with lingering aroma of coconut milk that is significantly less sweeter than Pappa Mia or Jin Jin. The green jelly-like worms here looked lighter than the usual bowls outside as they are freshly prepared by the lady owner, Helen, who cut-blend-strains the pandan juice before cooking it with green bean powder. There is a Chinese saying that goes "三顾茅庐" which means that one sincerely requests for certain favour from another person several times without giving up despite repeated futile attempts. I think that can truly describe my experience with Singapore Famous Rojak at Albert Food Hawker. The stall was unfortunately closed during my first two visits, but alas it was opened during my third visit on a Sunday afternoon. Pretty Mum has been urging me to try the rojak here after having the utterly disappointing Soon Heng Rojak in Toa Payoh Central. After a 15-20 minute queue, we managed to two plates of $2.50 rojak which looked dubiously redder than usual. Key ingredients such as the you char kway (dough fritters) and tau pok were crunchy but the sauce was too sweet to my liking. Even Pretty Mum concurred that the sauce went awry that day and was not as delicious as she had remembered. It was neither assertive nor tangy enough and I wished there was a more generous sprinkling of roasted peanuts. Could it because we ordered the smallest plate? Or could it be that the owner had a bad day? Well, both Pretty Mum and I don't have an answer to that but one thing for sure, the rojak in the wet market opposite where we stay still serve the best Rojak. Barely opened for less than a month, KARAFURU, a Japanese-inspired desserts cafe named after the Japanese pronunciation of "colorful" in katakana, has attracted throngs of avid social media fans and dessert enthusiasts for their colorful eclairs and parfaits. If you prefer choux with cracqueline crust, then you should look elsewhere as the version here is soft and chewy. This is not a bad thing, though I felt that it could stay longer in the oven for a nicer golden coloration and sharper aroma.In terms of flavor, there are quite a few which I enjoyed. For instance, the Gianduja ($6) is hard to go wrong with its pleasant milk chocolate hazelnut cream, candied orange and hazelnut dragee. Actually the queue was not that bad. We only stood for 20-30 minutes in line before we placed our order. This famous teochew noodle stall since 1968 has garnered raving reviews and how can any meepok lover possibly NOT try this at least once in their lifetime? I was quite worried that the noodles will be too sweet when ketchup is found in the sauce but it turned out otherwise! The wonderful chemistry between the chilli and ketchup sauce brought the meepok to life instantly. It's a spicy yet subtly sweet, with bits of crispy pork lard to close off a successful deal. If you have been following my Facebook or Instagram, you may have noticed that I posted a few pastries from a Osaka-originated patisserie in Lau Pa Sat. That was back in April when the shop was still occupying an awkward space in the hawker center. There were only some designated tables meant for the diners but they were barely taken up during the crowded peak lunch hours. Months later, this shop has not only underwent a huge refurbishment, but also swapped place with another Japanese bakery called Mugiho, which has now taken the original non-air conditioned space but business continues to be hot as you can see queues for their bread. Meanwhile, Delicieus has transformed into a smart cafe with pastries as the core. A wise move indeed, as customers can enjoy the cakes in the comforts of air-con and the cakes will not melt as quickly as before.